if you’ve been following my blog for a while, you know that i love nutella. i’ve made caramel-nutella crumb bars, chocolate nutella thumbprint cookies, + simple but amazingly delicious nutella cookies. 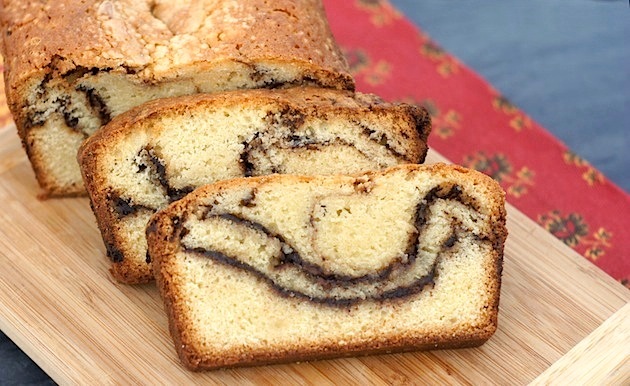 well, i now have another nutella recipe to add to the mix – nutella-swirl pound cake. i had this recipe bookmarked for ages, but had yet to bake it, as every time i had a full jar of nutella in the house, it would miraculously be consumed before i got around to making it. luckily, earlier this week, i had a quiet afternoon, + decided it was time to give this fab-sounding pound cake a try. i got the needed ingredients from the grocery store, including a brand-new jar of nutella, + set about baking. + the results? well, with two sticks of butter + an entire jar of nutella in the recipe, it probably won’t surprise you to learn that the pound cake is mighty tasty! the cake is moist, flavorful + rich without being heavy, while the ribbons of nutella add a lovely decadence + richness. it would be great for a mid-morning brunch, excellent with afternoon tea, or perfect as an after-dinner dessert. next time you’re looking for a fabulous sweet, give this pound cake a try! preheat the oven to 325°. lightly grease + flour a 9-by-5-inch loaf pan, tapping out any excess flour. in a glass measuring cup, lightly beat the eggs with the vanilla. in a medium bowl, whisk the 1 1/2 cups of flour with the baking powder + salt. spread one-third of the batter in the prepared pan, then spread half of the nutella on top. repeat with another third of the batter + the remaining nutella. top with the remaining batter. lightly swirl the nutella into the batter with a butter knife. do not overmix. bake the cake for about 1 hour + 15 minutes, until a toothpick inserted in the center comes out clean. let the cake cool in the pan for 15 minutes. invert the cake onto a wire rack, turn it right side up + let cool completely, about 2 hours. cut the cake into slices + serve. Yum! I’d love a slice with my morning coffee right now!!! Oh my, this looks some yummy goodness! This would be perfect with my blueberry hot tea:) thank you for sharing the recipe. i said the same thing when i made it – that it’s the perfect snack with a nice cup of hot tea. i have a blueberry/pomegranate tea that i’ll have to try with it this afternoon! Love this!! I love Nutella … and I love that this recipe requires very simple ingredients! Amy, this looks so great. Your swirled effect is absolutely perfect! And I took a look at your other Nutella recipes. I just bought 2 big jars from Costco so I plan on making them all! ooh, awesome! you’ll have to let me know which ones you try + how they all turn out. happy nutella-ing! Amy, just straight nutella from the jar? As in 1/2 the jar? And then the other 1/2? I think I’m going to make this and I don’t want to screw it up. Really want to make the malted choc chip cookies today too! Sneak peek at the recipe? Pretty please with nutella on top? yup, just straight nutella right from the jar! 1/2 the jar, then the rest! i heated it ever-so-slighty in the microwave, just to make it extra spreadable, but you don’t even have to do that. i’ll email you the malted chocolate chip cookie recipe momentarily! I love pound cakes and the swirl of nutella here just looks heavenly! Nutella is definitely a drug of choice here in the glutton household and I would happily enjoy a few pieces of your poundcake right now. ooh, off to check out the cookies – thanks for sharing the link! I am in LOVE with Nutella! This cake look delicious. Love the swirls!! I can’t wait to try it! I lucked out and got the rest of the cake when Amy was nice enough to swing by my office and drop it off. I delicately fanned out the slices on a nice plate (wife’s orders) and took a spin around the office. Minutes later, just crumbs and happy faces. Such is the power of Nutella. Thanks, love! aww, you’re very welcome – i’m so glad that you + the officemates liked it! This looks so wonderful, but I have yet to do anything with Nutella other than eat it straight out of the jar. It never lasts long enough to do anything else! I can not wait to make this! Just need a full jar of Nutella….like Lesley said…it’s doesn’t stay full for very long! Oh my. An entire jar of nutella? Yes please! It’s such a pretty pound cake and I love that you chose a loaf pan for baking. Gracious that looks delicious! Wow, this looks fabulous! Cake AND Nutella, sounds delicious. Holy yum, this looks amazing! I love pound cake and I love nutella, so this is pretty much a no-brainer. I’ll be making this soon for a special weekend breakfast! Can we still be friends if I tell you I’ve never had Nutella? A real winner this one is. Love nutella and pound cake. Pound cake is good for breakfast, snack, dessert or late night with milk. I think your swirl is pretty too. agree – leftover nutella always calls out to me, too, so i loved that this used up the entire jar! woah! this is awesome, i love poundcake as it is but nutella added in between the layers of poundcake is so clever and amazing! i want this now..seriously. Yum…love this, amy! I love nutella and biscoff spread, both of which would make an EXCELLENT swirl in your rich pound cake. I can understand why you bookmarked this recipe! Amy, that would make fantastic grilled pound cake!!! ooh, i’ve seen grilled pound cake but have never tried it – might have to fire up the grill + give it a try! you are correct! =) kroger does have a generic version that costs less than $3, if i remember correctly. i’ve used it before + i can barely taste a difference between it + real nutella. they do also have the chunky version but i’ve never tried it – you’ll have to let me know how it is! Amy this looks so delicious, I wish we were neighbors! I am SOOOO making this! I love nutella! My favorite is spreading it on a saltine cracker. Thanks for the fabulous recipe! WOW-you sold me on nutella! I love making poundcakes and now I really feel the urge to make this one! I come from the Italian region where Nutella was born (Piedmont), so I’m already in love with this nutella-swirl pound cake! how cool that you’re from the home of Nutella! Wow this looks so moist and delicious.. have to try it soon, thanks hun for another awesome recipe! I love Nutella too, and this pound cake looks fantastic! The swirl is so pretty. Such a great idea. your swirl turned out so perfect looking! I swirled nutella into pumpkin bread once and we loved it–must try this sometime! 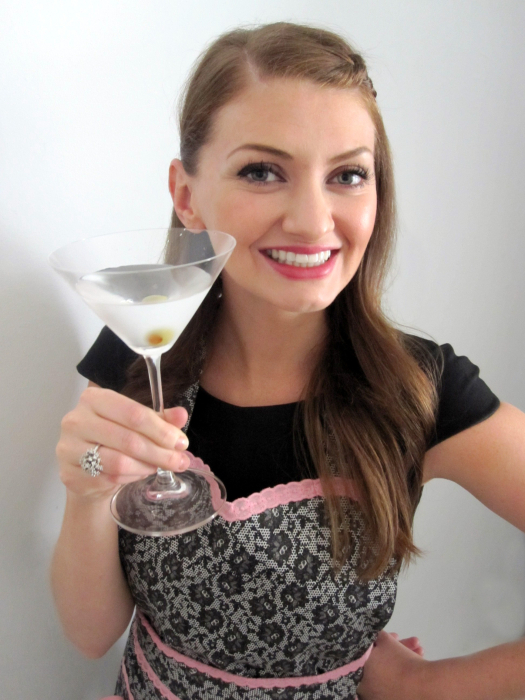 you’ll have to let me know what you think of it if/when you try it – i loved it! I’m so embarrassed to say I’ve never tried nutella!!! This looks amazing. I think I’ll be adding nutella to my shopping list for next week! I definitely remember that poundcake! I thought the same thing you did, with 2 sticks of butter and a jar of nutella how can it not be good?! Haha! Yours looks much lovely than mine did! we love nutella at home, too! what a novel idea…i like this because i am a pound cake freak!! !